Jsut got word today, that Lumberville PA’s Hair Rocket will be releasing their debut full length, Novelty, June 5th on Mountebank records which is also home to BOS faves Aderbat. Hair Rocket is the artistic endeavor of P. Crane and Chris Blasucci. It began as a documentary music video contrasting Carl Jung’s anima concept and Blasucci’s tragic love life. And it looks like they have a show lined up for release day at John & Peter’s in New Hope PA as well. Good stuff, check it out. While you’re waiting for June 5th check out one of their older videos for the song Come Here Be Near. My apologies to Lillie Ruth Bussey for missing her set as I arrived at Johnny Brenda’s this past Thursday Night for Aderbat‘s Cd Release party just as Bitter Bitter Weeks was taking the stage. They opened with one of my personal favorites of theirs, Lo-Res and the night was off to excellent start. Bitter Bitter Weeks jangly shimmering guitar pop sounded excellent despite the fact that Brian McTear was having some trouble with his voice going out early into their set. Next up was an hotly anticipated set by East Hundred, the crowd in the room seemed to double as they prepared to play. Fronted by the charismatic and charming Beryl Guceri their audience seems to be growing everytime I see them. They have a keyboard driven sound with an early eighties feel that would not sound out of place alongside bands like Echo and The Bunnymen or Siouxsie And The Banshees. Aderbat was up next, kicking off their set with We Belong To The Sea, the title track from their brilliant new album. Aderbat‘s music is a finely woven tapestry of melody and soft dynamics that draws you in deep and keeps you there. Frontman Matt Taylor has a look similar to a young Bob Dylan and voice I can best describe as somewhere between Jeff Buckley and Nick Drake. Imagine all that together and you’ll have an idea of what they kind of sound like. An excellent night of music all around. Some photos from last night’s show at Johnny Brenda’s In Philadelphia. Opening the night was Philly’s own Aderbat whose lead singer and bass player could pass for a young Bob Dylan and Kris Kristofferson respectively. It was my first time seeing them and they played an excellent set of music with a sound that falls somewhere between My Morning Jacket and Wilco. Great stuff, definitely add them to your list of must see Philly Bands. Up next was Brooklyn’s Via Audio, who played a high energy set of dance music with a distinctly eighties new wave overtone that the crowd couldn’t get enough of. Expect them to rise hot on the heels of fellow Brooklynites MGMT and Yeasayer real soon. Someone Still Loves You Boris Yeltsin closed the evening with their brand jangly guitar pop. After a rousing finale of their song Oceanographer, the boys came back out for an encore joined by the members of Via Audio for a “we didn’t practice this but we’re going to try it anyway” version of Nirvana’s Heart Shaped Box which, despite a few ramshackle moments, really rocked. 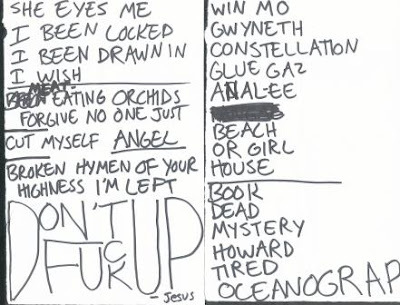 See the lyric cliff notes they had on stage along with a scan of the setlist below. A great night of music all around.